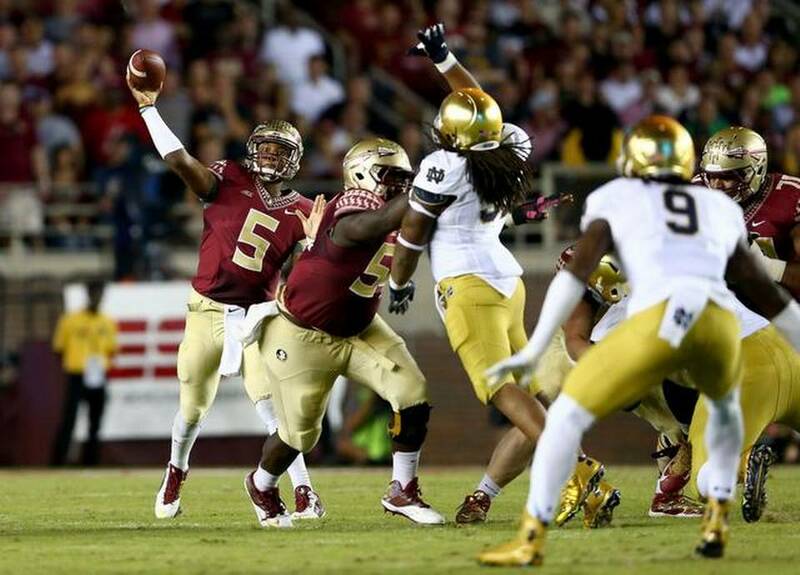 Jameis Winston guided his team to their 23rd straight win, this time beating Notre Dame 31-27. The game everyone was looking at this week was the 5th ranked Notre Dame Fighting Irish travelling to Tallahassee, Florida to face the 2nd ranked Florida State Seminoles. Both teams came into the game undefeated, with a chance to make into the four team playoff. These two teams have met in historic matchups in the past and this one lived up to the history of the series with the outcome being decided in the last seconds. Both teams started off slow, seemingly feeling each other out. Late in the 1st quarter, Irish senior QB Everett Golson led his team on a scoring drive for the first score of the game. The score came on a Golson 1 yard pass to sophomore receiver Corey Robinson, who happens to be the son of former San Antonio Spurs center David Robinson. The score seemed to ignite Florida State as quarterback Jameis Winston quickly answered the TD with a five play drive to tie the score on a pass to freshman receiver Travis Rudolph. The first quarter ended with a 7-7 tie. The second quarter started off with the teams trading interceptions on back to back plays. The end result gave the Irish the ball at the Seminole 31 yard line. Golson then hit Robinson for their second TD connection to give the Irish a 14-7 lead. The two teams traded field goals and the score going into halftime had the Irish on top 17-10. Both teams hit their offensive stride in the 3rd quarter with the Seminoles getting touchdowns on a pass from Winston to senior receive Rashad Greene and a 2 yard run by senior running back Karlos Williams. The Irish touchdown came on a pass from Golson to sophomore receiver William Fuller. The quarter ended with the game tied at 24 apiece. The scoring continued in the 4th quarter with the Irish connecting on a 46 yard field goal early in the quarter to take a 27-24 lead. The Seminoles answered on their next drive with a 1 yard run by Williams, his second of the night. Florida State now had a 31-27 lead with 7:39 left. After an exchange of punts, the Irish had one last shot with 2:53 left. Golson led his team on a methodical 10 play drive that moved his team to the Seminole 8 yard line with just seconds remaining. On 4th and goal from the 2, it appeared Notre Dame had the win when Golson completed a 2 yard pass to Robinson for what would have been his third score of the night. However, junior receiver C.J. Prosise was called for a pass interference that negated the game winning score. The ball was pushed back to the 18 yard line and the Irish had one last play, however, Golson’s pass was intercepted in the end zone by freshman linebacker Jacob Pugh and the game was over. You have to give Florida State credit. Everyone keeps trying to write them off, but no matter the adversity, they continue to win and keep themselves in the hunt for a playoff spot. The win was their 23 straight win. The Seminoles remaining schedule looks favorable and they have a good shot at making the ACC Championship game and likely a berth in the four team playoff for the championship. The Irish came out aggressive, going for it on 4th down five times, but they hurt themselves, only converting it twice. Notre Dame fell two spots to #7 in the country with the loss. They still have games against #14 Arizona State and end the season against #20 USC. If they win out they could still have a shot at one of the playoff berths. Jameis Winston, QB, RS Soph (6-4, 230): Despite his off the field issues, you can’t fault his focus on the game at hand. Has yet to lose a game as a starter. The offense goes through him due to his team’s struggles running the ball. Big arm with an ability to put the ball into tight windows. Able to snap his wrist and deliver the ball even when falling backwards. Patient in the pocket, waiting for routes to develop. Eludes the rush and extends plays. Attacks the defense downfield. Powerful runner. Completed 23 of 31 for 273 yards with 2 TD and 1 INT. Ran the ball 4 times for 8 yards. Karlos Williams, RB, Sr (6-1, 225): Big, physical north-south runner. Keeps feet moving after contact. Runs with determination. A good receiver. Nose for the end zone. Gives great second effort. Led the team with 8 carries for 25 yards and 2 TD. Had 2 catches for 27 yards. Rashad Greene, WR, Sr (6-1, 180): All-time leading receiver at Florida State with 223 receptions. Makes tough catches and has ability to make catches in a crowd. Elusive in space. Student of the game. Great concentration and body control. Led the team with 8 catches for 108 yards and 1 TD. Had a 33 yard reception. Josue Matias, LG, Sr (6-6, 325): Good trap blocker. Can struggle against quicker players. Mario Edwards Jr, DE, Jr (6-3, 294): Son of former Dallas Cowboys corner Mario Edwards. Big and powerful. Good bull rush. Knows how to get into passing lanes and disrupt passes. Had 4 tackles and 2 batted passes. Eddie Goldman, DT, Jr (6-4, 320): Strong at the point of attack. Has the strength to push blockers into the backfield. Had 4 tackles, 1 tackle for loss and 1 sack. Derrick Mitchell, DT, Sr (6-4, 303): Separates from blockers quickly. Gets good inside push. Had 2 tackles and 1 batted pass. Terrance Smith, OLB, Jr (6-4, 222): Active, versatile linebacker that can be on the field all three downs. Has the ability to drop into coverage or blitz the QB. Led the team with 11 tackles, 2 tackles for loss, 1 sack, 1 pass break up and 1 forced fumble. Ronald Darby, CB, Jr (5-11, 195): Feisty corner that battles larger receivers. Good in run support. Had 7 tackles, 1 pass breakup in the end zone and also called for a pass interference in the end zone. Tyler Hunter, SS, Jr (5-11, 200): Active player that plays the run and the pass well. Very good blitzer. Had 6 tackles, 1 pass breakup and 1 tackle for loss on 4th down. Everett Golson, QB, Sr (6-1, 200): Suspended in 2013 due to academics. Spent his time off working with QB guru George Whitfield and he has taken his game to another level. Responsible for 71% of his team’s offense. Doesn’t have great size, but he makes up for it by playing with a lot of heart. Has ice water in his veins. Led back to back comebacks before this game and he almost got his third straight comeback win. Very good runner and has improved as a passer. Elusive. Buys time in the pocket and extends plays with his legs. Throws well on the run. At his best when he improvises. Keeps eyes downfield looking to throw when he scrambles. At times is careless with the ball and he needs to work on protecting the ball better. Completed 31 of 52 for 313 yards, 3 TD and 2 INT. Ran 11 times for 33 yards. C.J. Prosise, WR, Jr (6-1, 220): Good combination of size and speed. At times needs to be more aware of where he is on the field, especially on 3rd down. Great footwork and body control on the sideline. Called for a pass interference penalty that wiped out the game winning TD. Had 6 catches for 59 yards. Chris Brown, WR, Jr (6-2, 195): Tough, dependable possession receiver. Gives up his body and makes tough catches. Had 5 catches for 38 yards. Ben Koyack, TE, Sr (6-5, 254): Good combination of blocker and receiver. Able to go in motion and be the lead blocker on running plays. Has soft hands. Runs tough after the catch. Had two catches for 29 yards. Called for a holding penalty. Ronnie Stanley, LT, Jr (6-5, 315): Good size for a left tackle. Dominating run blocker. Gets downfield to help out in the run game. Sheldon Day, DE, Jr (6-2, 285): Big defensive lineman that can play as a 5 technique in a 3-4 or move inside to defensive tackle in a four man line. Knows how to pressure the quarterback. Relentless pass rusher. Very quick off the ball. Uses his hands well to separate from blocks. Pursues all the way to the sideline. Had 2 tackles and 1 tackle for loss. Jarron Jones, NT, Jr (6-5, 315): Has the ability to “get skinny” to get past blockers. Disruptive. Uses his hands well. Had 6 tackles, 3 tackles for loss and 1 QB hurry. Joe Schmidt, ILB, Sr (6-0, 235): Lacks ideal height, but is always around the ball. Former walk-on. Makes defensive calls and gets everyone lined up in the right spot. Makes plays downhill in the running game. Uses great technique. Able to drop into pass coverage. Led the team with 9 tackles and had an interception that led to a touchdown. Cody Riggs, CB, Sr (5-9, 185): Transfer from Florida. Doesn’t have great size, but doesn’t back down from a challenge. Able to return punts. Had 4 tackles and was called for a holding penalty. Elijah Shumate, S, Jr (6-0, 208): Physical player that is good in run support. Had 6 tackles. This entry was posted on October 22, 2014 by draftmaniacs in Scouting reports and tagged 2015 NFL draft, Ben Koyack, C.J. Prosise, Chris Brown, Cody Riggs, Corey Robinson, David Robinson, Derrick Mitchell, Eddie Goldman, Elijah Shumate, Everett Golson, Florida State Seminoles, Jacob Pugh, Jameis Winston, Jarron Jones, Joe Schmidt, Josue Matias, Karlos Williams, Mario Edwards Jr., NFL, NFL Draft, Notre Dame football, Rashad Greene, Ronald Darby, Ronnie Stanley, Sheldon Day, Terrance Smith, Travis Rudolph, Tyler Hunter, William Fuller.